NEWS: The game has been closed on the 10th of August 2014. You can read the answers and Mycroft's reactions below. Even though most people might not think of strength as being an object, strength can be seen and felt, by anyone. The meaning of strength is to provide others with courage, as well as the person who is providing it. This is why I believe strength is what is served by misery, violence, and fear. When someone crawls out of a terrible place, or arises from a state of hopelessness, they emerge stronger. This strength is what gives us the power to make choices that affect our lives. This tends to some end, otherwise our universe is ruled by chance - which is what I believe to be fate. It is unthinkable to believe that we have absolutely no say in anything; that we can not change the future or control the present. No. Our strength MUST tend to some end. But what end? The end is the limit. The limit of fate and the limit of strength. I do not believe that, like with fate, everything is set in stone. I also do not believe that we control every single event that takes place in the universe. After all, how could we stop a meteor if there was one hurtling towards Earth? The end, is the balance between fate and choice. Is it fate that Moriarty was to return? Maybe. Is it fate that it is possible that Sherlock can lose? Perhaps. But I know that it is not fate, but strength, that Sherlock will need, to stop him. „That which does not kill us, makes us stronger.” – told German philosopher Friedrich Nietzsche. It is a well-known fact that I am an extremely persistent man. Persistence is also necessary for hope, intelligence, vision, creativity and success. I mean real success which has lots of work and achievement behind it. Who is steadfast, multiplies his/her possibilities and chances. The questions that I raised are very tragic, we all face them and try to find answers to them, because they are the biggest and most important questions of life. You have to be persistent to find the answers. This quality can be found in every creature, but unfortunately many people cannot find it or appreciate it in themselves. Yet each day we spend with useful things proves our persistence. You wrote about the limits too, that the negative events limit us and force us to make decisions. This is a wise statement. Just like you, I also think that these phenomena have their causes and we can learn a lot from them. We have to study them, study ourselves and the answers of others to them. We have to be aware of the nature of these things in order to live and understand. Many people may ask why I don’t prevent some tragic event since I am the ruler of the world. It is true that I have power, but I am by no means allmighty. Lions will always attack zebras, but we have to do something against the unreasonable tragedies caused by humans. Because of my age I found several answers to the questions, though I will not share them all with you – I would like to give the others the chance to participate, maybe there are still some who like to play. But one thing is for sure: there is a great need for people who are persistent and who like to think. And you, Ashley, have these characteristics – be proud of that. If you take the time and think on further answers, you certainly will find ways to make your life easier and to solve problems effectively – it will be beneficial for your environment too. Probably I will not surprise you when I say that I was waiting for an answer like yours. Though you are still young, you recognized your persistence and realized that you can profit from it. There are countless people who fail to do this, yet it is vital to hold on and to be successful. Realizing it you are a half-winner in life, and a true winner in the game. I kindly ask you to be patient, because I will close the game in August. 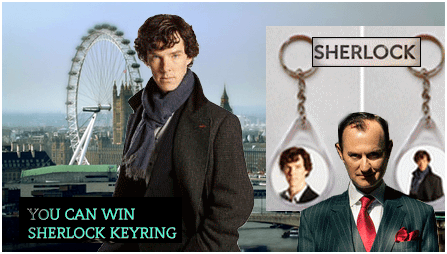 But you already won a keyring, and something else too – a nice Sherlock bookmark, made by a steadfast woman. I do hope both presents will remind you of that fantastic human characteristic that you already possess. Though this feature is not material, but it will always be with you. „Is it fate that Moriarty was to return?” – you ask. We cannot say it for sure, but you know, every fairytale needs a good old-fashioned villain. Well, I believe in Sherlock Holmes. Mycroft Holmes gives an extra gift for those answers that are especially close to his heart. This extra gift is a cross-stitched Sherlock bookmark. It seems as though you are asking about the meaning of life which I believe no man or woman could really answer. Religions try to solve it and people question it constantly, but is there really a meaning behind it? Is life just someone else’s dream? Will someone, somewhere will wake up and everything will disappear as we know it? Or perhaps there is some ultimate power somewhere controlling what we do. Or maybe that entity is just sitting back on a couch flipping through channels on a television that narrates different individuals’ lives. There is no true meaning, if you ask me. We’re born, we live, we experience, we learn, we teach, and then we let go. Slowly running out of steam before joining with the Earth. We’re expected to live how we wish to live, move how we want to move, learn from others, teach others, passing on all that we know before we expire like the many people before us. We choose the good path or the bad path. We decide what route we’re going to take, and it’s not always the correct one. People make mistakes. That’s just what happens. And sometimes, these mistakes are based on something that someone else has done to them. Nothing serves this “circle of misery and violence and fear”. If anything, human kind is what fuels it onwards. People harm others, curse others, destroy others and all that does is bring about another who does the same; perhaps because they want someone else to feel like they do. They don’t want to be alone and that fear--the fear of being left to suffer in one’s loneliness--that is what ultimately keeps this circle moving in the same direction. It may never end. It’s a circle of revenge and of hatred, of fear and of worry. As long as there are people on the Earth, people who feel emotions, make mistakes, and people who choose to make a decision or a choice (be it good or bad), the cycle will not end. Get rid of that, and all we have left is emptiness. A dark void that humanity should be filling, but that they have left open for someone else to fill. And then what? Someone else fills the void left behind by humanity finally ending that circle of hatred, and it starts all over again with a new species, a new form of fear and revenge. The cycle will never end as long as humanity is around to fill it and the meaning will forever be truly obscured and biased on people and their various opinions. But ultimately, it’s all the same. Life is meant to be lived and passed on. Read slowly like the pages of a book and once you reach the end, you smile, and remember what had been left behind in those pages, before moving onto the next and leaving the meaning of life behind. There are situations when the road we choose is more important than the aim. At present we are like the police officers who were called in by Sherlock with gunshots. We are on our ways – and we have to believe that we can do something against violence, but we don’t inevitably have to use brutal methods. There are lots of good examples for that in history (Mahatma Gandhi, Desmond Doss, dr. Martin Luther King Jr. and so on). My answer is short but honest. I rarely make mistakes, and this is no exception. You won. Many famous philosophers have thought on this same question. Not that the question was phrased in these exact words. But whatever variant they pondered, it makes no difference. Though the wording is slightly dissimilar, the question is the same. Of course, it is the question that has haunted mankind since we first began to wonder about more than surviving another day. What is the purpose of life? Life, at its most basic, is fulfilling our basic needs so that we might keep living. But why bother? Why live if the only motivation is to keep living? What is the object of that? And there it is. The circle. Every day, we fight through pain and loss, only so that we can keep living and suffer more pain and loss. We strive to earn money, to gain power, precisely so can gain even more money and power. It's a never-ending cycle of desire, because we are never satisfied. It is never simply enough. So we endure this constant pain of living to give ourselves material happiness in the present. Which, by the way, is a very loose definition of happiness considering that this emotion stems from temporary bliss achieved chiefly by ignorance. Ignorance of what, exactly? Ignorance of the circle. We choose to ignore that our lives are composed of constantly wanting more than what we have, and in this ignorance we find temporary happiness that is nothing but a fictional pretense to soothe our minds. We choose to shut ourselves off from asking the point of all this, the point of life, because we would rather fill our short lives with material happiness than introduce doubt into the equation by questioning the purpose of our existence. When we find something we can't explain, it frightens us. We don't admit it, but it does. When we can't find an explanation, we pretend the question doesn't exist. We ignore it. Since we would rather be blind, we become blind. We forget to think in favor of finding whatever simple pleasures we can. So... what, then, is the point of this cycle of human ignorance? The easiest answer, but the hardest to accept, is also the simplest. There is no purpose. There is no point, no hidden truth. We're alive simply because of chance. No divine purpose guides us. The only truth is the cold, hard reality: we simply exist. There's no reason why, except for the obvious scientific explanation of how we came to exist. But then again, a scientific explanation only answers how, not why. Humankind only exists as we do today because of sheer luck. Of course, there are countless other possibilities, enumerable answers. Many people find their answer in religion. They believe they are here on Earth to serve a greater being than themselves. In this way, they find their purpose in striving to better themselves so they might be worthy of whichever deity they honor. A similar theory, another one that stems from religion, concerns more than just the individual's soul. Much like the previously discussed theory, the believers struggle to banish evil from their lives. But in this answer, they also try to eradicate evil from the world in the name of their religion. This often means they try to convert others to this same belief, in the hopes of helping more people to better themselves and thus shutting out sin and general wickedness. Many people have similar beliefs, which involve freeing the world from malevolent forces and promoting goodness in everyday life. However, this theory is slightly different, as it does not stem from a religion. Some people claim the purpose of life is to practice exiling greed and selfishness from their own hearts. They endeavor to live the best life they possibly can live by just being good people. According to this mindset, the purpose of life is to serve the greater good. Those who think this is the purpose of life do not do it for the sake of a deity; no, they do it simply because they think it is the right thing to do. Another common answer is happiness. Plain and simple, the purpose of life is happiness. Well, it seems simple. But how simple is happiness, really? Happiness means different things to everyone. For some, it is finding inner peace. They reconcile themselves to being content with what they have. Peace with nature, peace with others, peace with their own weaknesses and strengths. To others, happiness means more material things. Trivial things, one might say. Power. Money. Fame. Even destruction. Everyone has something they want more than anything else. Perhaps the purpose of life is to strive for that goal. Striving for individual happiness by fulfilling our ambitions could very well be the purpose of our existence. Though this outwardly appears to be a more selfish answer as to the purpose of life, there is nothing to say it could not be the correct answer. Others state that the purpose of our short existence is to help others. We are alive only to provide whatever assistance we can to those around us. In short, the purpose of life is to make others happy. This seems like a good way to live life, doesn't it? Helping others at every opportunity, brining joy to the world... But while this is a noble goal, it calls into question the purpose of mankind as whole. If we exist to help each other, do we exist to further the existence of mankind? Yet again, that brings us back to the aimless pattern of the circle. Staying alive simply to stay alive. No purpose, only primal instinct to not die out as a species. A similar theory, but one that applies on a broader scale, is that we are alive to help the planet as a whole. Helping humans, yes, but helping other animals and nature as well. It is true, we can certainly help prevent some species from dying out. Undoubtedly, there is work we can do to improve the cleanliness of the environment. But first we must consider: the planet existed for billions of years before mankind even existed, and it seemed to get along just fine without our aid. Not only is the planet fine without us; it is better without us. Humans have hurt the earth's ecosystems more than any other living thing. Compared to all the harm we've caused the environment, our supposed 'help' is next to nothing. Many of the species we strive to save from extinction are only in danger of extinction because of our own actions. While it is a distinct possibility that we exist solely to help the world, we have caused enough damage to prove that this theory is somewhat questionable. So, evidently, there are many different theories on what the meaning of life is. But which answer is the correct answer? Truthfully, I don't know. No one does, and anyone who claims to know the precise meaning of life is a fraud. It is my belief that everyone must uncover the meaning of life on their own. There isn't one simple answer. The meaning of life isn't some generic, one-size-fits-most explanation that anyone can buy for a few dollars at the local Walmart. Neither is it an answer of the pop quiz variety, the kind that can be looked up using the infinitely helpful Google and jotted down in a matter of seconds. Really, there is one definite reason for this: there isn't one explanation for why we exist. The reason for our existence is a mystery that must be discovered by the individual mind. Why? Because the answer is so strictly individual. Every person has a different purpose. Something that is perfect for him, something that gives him goals and determination. An answer to why he exists in this world. For some people, it's a job, some form of occupation that they believe is their life's work. Painting, writing, architecture, philosophy, science. Others find their purpose in devoting themselves to helping people who need food and shelter. Some believe their sole purpose is to find peace with nature or dedicate themselves to religion. No one can articulate precisely what the meaning of this short existence is, because there isn't just one answer. From a purely cynical perspective, we don't have a purpose. We live merely because we choose to keep living. Nothing more. Going back to Doyle's words, life is a "circle of misery and violence and fear". Life must have a meaning, or it is entirely irrelevant, nothing but surviving so we can survive. There is no purpose at all. We waste our lives searching for an answer that simply isn't there, and we are only here to keep living so our species doesn't die out. But perhaps that theory doesn't encompass human nature. Perhaps the purpose of life lies in the very act of looking for a purpose. Isn't that human nature, after all? To strive for greatness, to be curious, to look for answers in the unlikeliest of places. Maybe the meaning of life is simple. The purpose of life is to find a purpose. When we find our passion, what we believe we are destined to do, we have found our purpose. Though there are countless theories as to what the point of it all is, only one pervades every single one of the other answers. The purpose of life is finding a purpose. That is the meaning of the endless circle mankind is caught in. The meaning of life is to stop and think. Instead of appreciating shallow, temporary happiness, we must admit our ignorance. Cast away our blinders that warn us not to wonder, not to think. When we have done that, we can begin our search for purpose. It takes courage to question our very existence, bravery that we very often don't comprehend. After all, what requires more bravery than questioning why we even should bother living? And in that very act of accepting there is more to life than basking in our own ignorance and living another day, we find the meaning of life. The answer that eludes great minds across the world. In the end, we find the answer inside ourselves. Right where we always knew it would be, if only we had the courage to search for it. You certainly know that there are long columns online about the meaning of life. Your writing resembles to them, yet it has a very unique form. Congratulations. I am glad that you took the time for the game though you are young. You have persistence, patience, you are precise and talented in searching and in methodizing. The latter is not too common nowadays. Facebook, Twitter and SMS sending may be useful, but their great disadvantage is that they limit communication. Lesser words lead to poorer vocabulary and shorter thoughts. That makes building up theories which contain related thoughts more difficult. Such theories are used by Sherlock Holmes, Jim Moriarty and a little earlier Albert Einstein had some too – and I use them as well. I ask you to treasure these fantastic abilities and choose a profession where you can use them, because the world will always need people like you. They will make excellent IPOD members – and thank you for already belonging to my club. Your registration made me happy. You know, the IPOD CLUB is a silent place, but I am not worried about you. Such a wise mind like yours knows when it is time for contemplation but never forgets the importance of communication. I think so that you are doing very well at school. Do not let difficulties upset you, because the foundation of your mind palace is excellent. You will receive two keyrings, and the face of my brother will encourage you that you are on the right way. In my perspective, the possible answer to the question, "...What is the meaning of it? What object is served by this circle of misery and violence and fear? It must tend to some end, or else our universe is ruled by chance, which is unthinkable. But what end?" would be life. The object itself is not life though. For it is the meaning of it. "It" is death. Death is a gateway for life to begin again.Death is the cause of misery for the loss of a loved one. Death is the effect of violence when put on a person so much, it kills them. Finally, people fear death, we fear to lose, to miss, to hurt. But, the meaning for it is a way to more. When starting the game I mentioned that this topic cannot be thoroughly discussed only in a few lines. Yet you did it. You are not a pleonastic, you spared your keyboard, you avoided evasion and proved that you are brave. You gave a short, deadly answer. It would be unfair not to appreciate this. I’m a politician and businessman, I often have to close negotiations very fast. You have the future businessman in yourself. You won a keyring. Of course I encourage you to dare to communicate, because it is an integral part in problem solving. You have clever thoughts, dare to show them to the world. In The Adventure of The Cardboard Box, your brother, Mr. Sherlock Holmes, dealt with a never ending circle of misery. It first started off with the unhappiness of Miss Sarah Cushing, who was desperately jealous that her lover, Mr. Jim Browner, has moved on to loving and marrying her younger sister, Mary Cushing, or should I say Browner. She in turn tried to persuade her sister that Mr.Browner was an evil man, and one who could not be trusted. That was the beginning of his unhappiness, which grew into sheer rage when his wife began loving a friend of Sarah Cushing, Mr. Alec Fairbairn. The next to feel the surge of sorrow were the secret couple, Mary Browner and Alec Fairbairn. Their love was never meant to be, for in the midst of their boat ride on a lake, Jim Browner, out of what he felt as indignation and an uncontrollable temper, savagely murdered the two, and cut off their ears. These "tokens" were intended for Sarah Cushing who he blamed for the entire tragedy. She of course was very content with her doing, until she heard news of a little cardboard box containing severed ears that had mistakenly been sent to her sister, Miss Susan Cushing, who had no idea what it meant but upset her greatly. Miss Sarah Cushing immediately new the meaning of the parcel, which provoked her guilt so much so as to the point of brain fever. So you see, it was indeed a circle. It first started off with Sarah's jealousy and unhappiness, and ended off with her guilt and unhappiness. But their is another link that has not yet occurred, but undoubtedly will. That is the sadness of Susan Cushing when she finds out about the death of her sister. That will lead to yet another circle of unhappiness. But, even that will eventually fade, most likely with her passing. So you see, in essence, Sherlock Holmes was questioning death. Death is the beginning of all misery and violence, and death will be the end of it. Whether it be a metaphorical death, as in this case was the "death" of Sarah Cushing's love, which caused the circle of sorrow, or if it be a physical death as in that of Mary Cushing and Alec Fairbairn, and even possibly the death of Susan and Sarah Cushing, which would end that particular circle. But of course the death of those two women may cause another chain of gloom to form for some other people. Theoretically speaking, sadness will never cease until the last person on earth is gone. Our universe is not ruled by chance. There will always be a cause and effect. And the underlying facts are that death will be the cause, and it will also be the end. It is a joy for me to see that there are still young people who use netiquette. It is true that the Internet is a virtual world, but we must never forget that it is made by people for people. Greeting others is a well-mannered thing, it is the sign of respect. It helps to start a conversation in a better mood. Greeting is a basic rule in my IPOD CLUB, and even my brother Sherlock tries to observe it. You observed the importance of timing, when Sherlock raised the question. You would make a good detective, because antecesents are always significant. Thank you very much for keeping an eye on this detail. Your answer is outstanding. You won a keyring and a bookmark. I wish you successful investigation – the world is full of great mysteries. I'm a bit older than the other people I noticed that answered. (49) I've had reason to sit and ponder "What is the purpose to the circle of misery and violence and fear." In between Series 2 and 3, we know Sherlock pursued Moriarty's network. It cannot have been easy--we saw him beaten once, it probably wasn't the only time. His life was also greatly changed when he returned. Even though he had truly done what he had done for a good reason, due to his subterfuge. We see that he has learned a great deal from the man we met in Series one--the "Great Man" that Lestrade spoke of has indeed become a "Good man" willing to give up whatever he must for his best friend's happiness. Of course, it is *Sherlock* so he does that in unconventional ways, and his thought processes are so convoluted that John really wouldn't figure out how much he truly cares about him, but it's obvious to the TV viewer that he cares... by the end of the Series he had essentially given up "The Work", and his life for John... before that last minute reprieve. Now, hopefully, John will realize this in Series 4? Personally, I have been through quite a bit and seen people deal with pain, suffering and fear either very well or, very badly... and I have come to the conclusion that meaning is brought to that suffering or fear by other humans and how they deal with the situation-- with empathy. I believe that *we*, must bring a reason to that suffering... by giving a purpose and meaning to all we have been through. *While* my mother was ill, I got pregnant --which I wasn't really planning on-- but that was ok, we were happy about the baby. She was very welcome. Life was stressful, but new babies are the most beautiful, soft and cuddly things... (they do cry loudly though... lol.) ...but they also smell great after a bath. Anyway, I thought at that point I had reached the height of "hard times". I knew my mom would die soon, I'd lost my father who I adored, but I had a new baby... and I loved my job so there were good points to life... things were carrying on okay and I thought I would be able to get on with life... and then the bottom fell out of my world. There was so much about this incident that was full of pain, horror, loss, and complete powerlessness. When I got to the ER, I asked the Nurse when I heard what had happened, could they at least donate her organs. Because while we had lost a COMPLETELY healthy child, there are SO many healthy children dying for lack of organs out there every day... they refused. I don't really know why. There wasn't a mark on her, her blood work was completely clean. To this day I don't understand that one--unless that hospital was just not equipped to do transplant donations? I don't know. Seems impossible to me, but what do I know. It would have been a solace to know that somewhere out there children lived because of her, that would have died otherwise. I now believe that we are supposed to use what we learn from our pain. I believe we have to, or it is in vain. Whenever I know that a friend's child has died, and I go to talk to them and ask them if they'd like to talk about their child... and I see their face ... because people are incredibly hesitant to bring up a dead child after they have died, especially to the parent. But do you know what? They really do want to talk about them! In a respectful way, of course. In a loving way. To this day when someone asks me how many children I have, I'm never sure what to say. Do I say 4? 3 and an angel? To pretend I never had her is to act like she wasn't real, which she definitely was. I went to talk to a friend after his son had passed and asked if he wanted to talk about him, and we talked for a good hour or so. We compared notes about the horrible things people say at the funeral like "Oh, he's in a better place" ... No they aren't. We want them with US. One woman told me she knew exactly how I felt because her dog had died. I'm sure it was sad, but it's truly not the same to lose a beloved pet as a child. After not really realizing I wanted a child to suddenly just... needing one... I got pregnant again almost right away. I had another daughter almost exactly a year later. If we don't live life, feel the bumps, bruises, pain, fear and depression... we can't help others. My job was as a Hospital Corpsman. I'm now working in a library. I still meet people who walk in and I can relate to their problems and sometimes assist them-- either because I know how to best get Veterans Benefits, or because I've had spinal surgery and I know how that feels ... OR sometimes it means not saying one word and just shutting up and letting the other person talk. Most of the time, it means giving our time, our empathy, enough information to let the person know we do understand ... then shut up and let them talk. I've found most people are lonely, and they would just love a chance to talk to someone for a little while... so I try to be that person... because in the circle of life, other people have been that person for me, many times. It's time I returned the favor. I see from your answer that you have a lot of experience and you took your time to think the question over. My sincere thanks for taking it seriously and finding time for such a detailed answer. I am especially thankful for your personal memories. You have to have trust for doing that. Please let me give some of my time and trust to you in return. King Solomon was respected as a sage. He always wore a ring with the engraving „Nothing lasts forever.” When something happened to him, good or bad, the ring made him remember that everything is transitory. He knew all things will pass, so he could appreciate the good events. The engraving brought him solace when he experienced tragedies. Many misfortunes happened to you, but it does not mean that the sentence on Solomon’s ring can help you. People are different, and they have different reactions to the same things. Some find peace, some never attain it. Lots of people do not know what the meaning of life is, so every day is a misery for them. But some extraordinary people can achieve more. The American writer, Helen Keller, who was blind and deaf, yet extremely steadfast, knew this very well. She said: „Although the world is full of suffering, it is full also of the overcoming of it.” My opinion is that every outstanding man/woman begins with the fact that they survive day after day. They do not give up, maybe out of defiance, maybe out of necessity. They simply hold on. And as time passes, they find even more answers to the big questions through their experiences and thoughts. It is inspiring that you have the strength to care for your children and for other people too, despite the tragedies you had to endure. Dear Tarotiste, many thanks for your answer. Of course you won keyrings and a bookmark too. P.S. I think it is right to say that you have four children. According to religions no soul is lost, and physics says the same about energy.